1998, rather than 1988 – makes sense. Image sourced from the South Staffordshire Railway site and illuminated by Ian Pell. Original Image thought to be by Ben Williams. 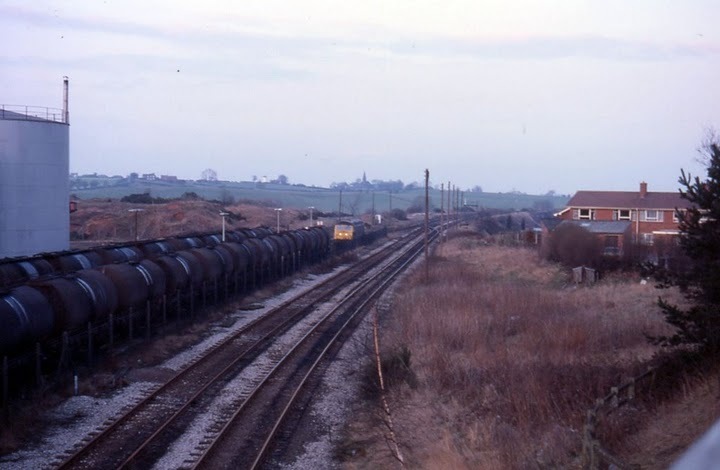 Top rail historian Ian Pell, late of this parish, dropped me a line today to point out the origins of the photos that I borrowed from the South Staffordshire Railway Site to illustrate yesterday’s article about Charringtons Oil Terminal and Anglesey Sidings. Just a quick thank you regarding the article. It will be interesting to see if we get any response. Couple of minor points. Quite a few of the photos on the South Staffs Rail site are non-attributed. I know Rob is trying to sort these out but for your information the first photo was I believe taken by Ben Williams. 37220 the lead loco is in EWS livery and as such the picture was probably taken in 1998 rather than 1988. In fact in 1992 it was in Trainload Petroleum livery, based in Cardiff and named “Westleigh”. 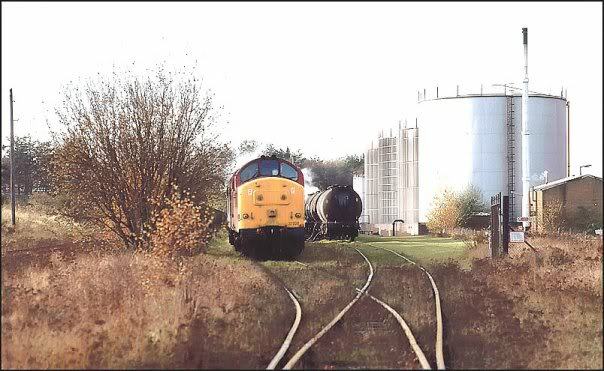 By 1998 it was based at Toton as part of the EWS fleet for oil trains in the East and Midlands and as such was used on Thameshaven – Brownhills workings. The second loco of the pair of class 37’s is unknown although it is in former Civil Engineers ‘Dutch’ livery of grey and yellow. The second photo is a little easier being by Tim Marshall and showing 47277 on the 18th March 1985. Note that the main lines are still in-situ, although closed to traffic, and the signal box has gone – replaced by a ground frame. I am, of course, happy to clear this up and my thanks to all involved. I must say, the world of railway history really is a different ballgame, isn’t it? The precision is startling. Class 47 47277 at Anglesey Sidings on the 18th March 1985. Image sourced from the South Staffordshire Railway site and illuminated by Ian Pell. Original Image by Tim Marshall. This entry was posted in Bad Science, Brownhills stuff, Environment, Features, Followups, Interesting photos, Local Blogs, Local History, Local media, News, Reader enquiries, Shared media, Shared memories, Spotted whilst browsing the web and tagged Anglesey Sidings, Brownhills, Brownhills local history, Charringtons, corrections, errata, Ian Pell, local blogs, Local History, New Photos, Oil Terminal, Redevelopment, South Staffordshire Line, Staffordshire. Bookmark the permalink. “the world of railway history really is a different ballgame, isn’t it? The precision is startling” Indeed. However, I think that your correspondent is slightly incorrect in his correction. He writes: “in 1992 it was in Trainload Petroleum livery, based in Cardiff and named “Westleigh”. ” I believe the correct name was ” Westerleigh” after the Murco Oil terminal located near the village (and railway junction of that name) just north of Bristol. Alex is quite correct regarding the spelling of “Westerleigh” and I apologise for my error. Humble pie, etc, etc, I would say, however, that I have never professed to be “an expert”, just someone with a great interest in the South Staffs line. Well done Walsall Wood FC. ! Reminds me of the glory days of the late 1940’s and early fifties. In 1951 the Wood reached Round One of the F.A. Amateur Cup, playing Walton & Hersham, a top amateur club from the South, on the 15th December. What a match ! Haynes. Horace Gandy and Jack Male were three of our stars. Programme was 3d in those days. I live a distance away, but still follow the fortunes via the internet..
Glad you have posted an email address. I’ll be in touch.